Over the years, our team has collected and compiled hundreds of cookbooks and recipes, manuscripts, magazines and rare documents, dating from the late 19th century to modern days. This exceptional library – one of the world’s most comprehensive – related to food and dining in ancient and modern Siam gives us extraordinary access to firsthand knowledge, and enables detailed research into the culinary evolution of dishes both familiar and unknown in the west. Our workshops have been called “revelatory” by attendees, because they discover so much more just how to make the recipe during these dynamic sessions. 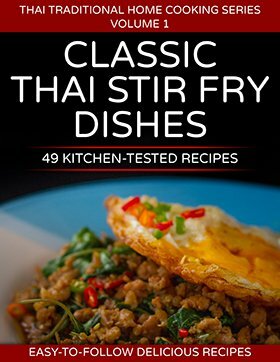 We are committed to educating participants in the Thai culinary codes, providing the history, facts and folklore behind each recipe: the legends, trade routes, migrations, conflicts, social issues and other factors that have influenced a dish’s appearance, taste and composition. Because Thai cuisine is so varied, our workshops are highly focused, and specifically customized to the student’s preferences and tastes. We collaborate with workshop participants to identify their particular area of interest, and tailor the sessions accordingly. In addition to our in-house team, we have a wide network of contacts in the field: chefs, academics and other culinary experts. We custom-build the optimal team for projects of all sizes and functions. If your project is not listed here, please contact us for further discussion. As researchers and writers fluent in English and Thai, we can provide a wide range of food- and dining-related material to private individuals, journalists and documentarians. This includes the provenance behind both rare and common dishes, records of a recipe’s first appearance in print and other valuable data. We are happy to provide photographs, research and text for related articles and summaries. Our team offers interpretation services and location scouting for seminars, films and long-form articles. We can provide preliminary research, as well as additional expertise in English and in Thai. Our team includes chefs with extensive experience in restaurant advisory. We provide guidance in Thailand and abroad for restaurants and chefs seeking to bring their establishment beyond the ordinary boundaries of the usual Thai menu offerings. Finding the right ingredients can be challenging in certain regions: we offer support in adapting ingredients easily accessible in the home country to Thai dishes, so that the entire plate makes perfect sense. We can also help source artisanal or difficult-to-find ingredients and other food-related items. We look forward to working with you as you embark on – or as you continue – your journey into the extraordinary and fascinating universe of Thai cooking.